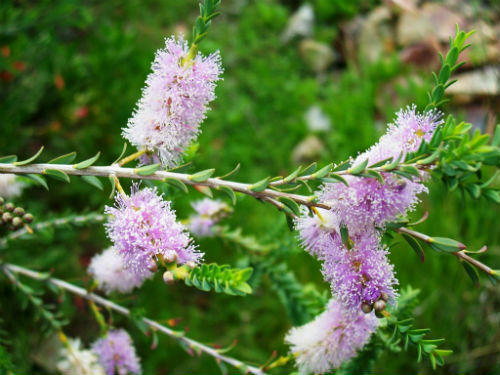 Melaleuca decussata, Cross-leaved Honey-myrtle is a tall, rounded shrub reaching height of three metres. Small leaves are arranged in two pairs of opposite rows forming a cross when viewed from above (hence the common name). Mauve flowers are held in small, cylindrical spikes on short lateral branches. Flowers fade to white as they age. The flowering period extends from late spring to summer. During this period plants become covered with mauve and white spikes, depending on the age of the blooms. Prune after flowering to keep plants bushy and blooming bounteously. M. decussata is widely cultivated and has proved to be hardy and free flowering. The Cross-leaved Honey-myrtle would be a useful addition to native shrubberies. The dense foliage provides safe nesting sites for small native birds. The species will cope with dry and moist situations. The species name also refers to the leaf arrangement. M. decussata was grown in Kew Gardens, UK in 1803. The second image is from The Botanical Cabinet. This is a 20 volume catalogue that describes exotic plants grown in Conrad Loddige’s Nursery in Hackney, London. The volumes cover the period from 1817 to 1833 and contain over 2000 plant images and descriptions. 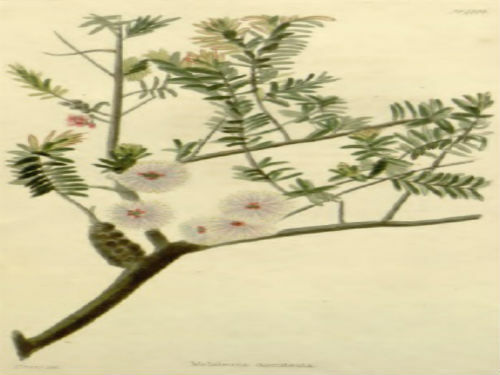 M. decussata appeared in Volume 13, published in 1827.